Create a glamorous texture for that special occasion with a triple row of dazzling cubic zirconia gems, sitting in a rose gold plated metal and all secured with a fashionable bead lock for a shining statement piece. 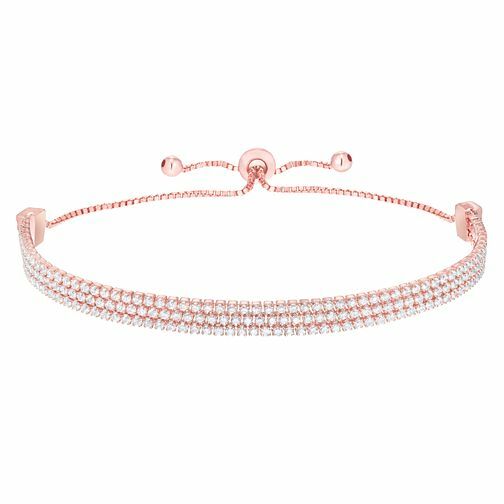 Rose Gold Plated Silver Cubic Zirconia Triple Bracelet is rated 3.6 out of 5 by 5. Rated 5 out of 5 by Anonymous from Lovely! Can't fault this - looks great on! Very sparkly and a good price at the minute. Rated 5 out of 5 by Anonymous from Stunning bracelet Beautiful bracelet, I used the gift option and thought the box and little note that came with it, so pretty. Only downside was the bracelet was not secured in the box properly, so when my sister opened it for her 21st birthday, the bracelet had all fallen to the bottom of the box scrunched up. But the bracelet itself is lovely!